As the three small, green arrows shot towards Nie Tian like three wisps of ethereal smoke, loud rolls of thunder rang out in Nie Tian’s ears. In the meantime, incomparably strong spiritual power burst forth from within them. Even though they were still a long way from Nie Tian, his eyes were already starting to hurt. He instantly had an idea as to how mighty the arrows were. Feeling a sense of urgency, he hastily tried to summon power from his spiritual sea, yet he discovered that he couldn’t draw any power from his vortex of star power and vortex of flame power. His vortex of wood power was the only one that didn’t seem to be affected, and was still spinning at a high speed. Glittering, green spots could be seen floating at the bottom of the vortex of wood power, which carried the broken will of a titan. Pure and rich liquidized wood power rushed out of his vortex of wood power and poured into his meridians like numerous green streams. In the next moment, streams of misty, green light started to rise from within Nie Tian, which rapidly swirled around and eventually enveloped him. It was as if the misty green light had formed a emerald pagoda over Nie Tian. All of a sudden, the nearby ancient trees seemed to be attracted to Nie Tian. Wisps of freshly-green wood power started to converge on and infuse into him. After receiving wood power from the vicinity, the emerald light swirling around Nie Tian started to shine increasingly dazzlingly, causing Nie Tian, who was bathed in rich wood power, to feel full of vigor. Sha Cheng’s three small arrows, which were wreathed in cyan lightning, bombarded the layer of misty, emerald light around Nie Tian. The green arrows instantly exploded, sending out wisps of toxins and lightning that intended to penetrate the thick layer of defensive light. However, as powerful as they were, their efforts turned out to be in vain. In the meantime, Nie Tian was struck by a clear feeling that he was being nourished by the rich wood power within the layer of emerald light around him. Wood power and flesh power he had absorbed from the spirit vermin swam around among his internal organs, helping him neutralize the toxins. He examined himself with a wisp of soul power, which he extracted from the fragmentary stars, and discovered that the strands of brown toxins were fading away from his internal organs, and the Crimson Chain Snake’s poisonous blood on his skin was also disappearing. Meanwhile, the sore and powerless sensations he had been feeling were also greatly relieved, along with the mind-numbing dizziness. Furthermore, the various vortexes within his spiritual sea, which seemed to have temporarily stopped, returned to normal again, and the various types of power were once again at his command. All of a sudden, a vigorous life force brimmed in his heart, causing his heart to race. As the numerous slim, crystal-like chains within the green aura shone with dazzling and mysterious light, a wave of unfathomable energy fluctuations spread out from Nie Tian’s heart. Immediately, all of his powerless and negative sensations were swept away. No longer affected by the toxins left in him by the spirit vermin, he felt as if he were vested with a profound force. With a swing of his Flame Star, he shot its blade light of three powers straight forward with a momentum that could sever everything in its way. Wherever the blade light extended, the earth cracked open, and crackling sounds filled the air. Sha Cheng’s expression flickered drastically as he hastily formed hand seals. Thunder and lightning instantly wreathed and filled the space between his palms. A moment later, a large, translucent centipede came to form in the air before him. The centipede was almost identical to the one that had just exploded and died. The only difference was that it was many times larger. As soon as it appeared, it started to twist about, giving rise to flickering lightning and rumbling thunder. The floating, intangible centipede glared at Nie Tian, as if it were going to unleash some sort of psychic attack. However, before it could form any magics, the Flame Star’s blade light whizzed over and bombarded its head. The centipede, which Sha Cheng had formed with the Poison Sect’s secret magic using his psychic power, spiritual power, and poisons, was instantly cut in half from head to tail. Sha Cheng’s eyes dimmed slightly as he coughed up a mouthful of blood. Then, he shot a nasty glower at Nie Tian. However, as his blood spilled on the split centipede, the two halves of its body morphed into two new centipedes, which became active and restless again. Sha Cheng seemed to realized that Nie Tian wasn’t so easily dealt with. Fearing that others might come to his aid, he once again decided to leave. He released a thick, brown smoke, enveloping him and filling his path of escape. Soon, he disappeared from Nie Tian’s sight. The two newly-formed centipedes seemed to be vested with new, extra life power from Sha Cheng’s blood. Their intangible bodies solidified as they shot madly towards Nie Tian. Nie Tian let out a cold harrumph and launched another short-range Starshift, turning a blind eye to the two incoming centipedes. A streak of starlight flashed by, and the next moment, he appeared within the grayish-brown smoke unleashed by Sha Cheng. His vision was compromised, preventing him from getting a clear view of everything around him. Even his Heaven Eyes, which were floating high in the sky, were temporarily blocked by the grayish-brown smoke. He could only see via his Heaven Eyes that a line of smoke stretched far into the distance, but he couldn’t see through the smoke and locate Sha Cheng. By the time Nie Tian enhanced the perception of his Heaven Eyes with more soul power from the fragmentary stars and determined Sha Cheng’s location, he had already reached the edge of the floating continent. Hence, Nie Tian launched another short-range Starshift, and arrived behind him. However, just as Nie Tian was about to launch an attack, another Poison Sect disciple rushed over from the void, treading on a sizable rock. Nie Tian’s expression flickered as he instantly stopped his dashing momentum and turned around. As he approached the continent, the rock he stood on suddenly exploded. Meanwhile, he seemed to have flown into an enormous, invisible ward, and instantly bounced back, blood flowing out of the corner of his mouth. “What the....” Confusion filled the man’s face as he stared at the floating continent before him, and didn’t dare to make another attempt. “Umm... I think he’s fine.” Sha Cheng sounded hesitant. With these words, he, who had already sustained injuries, unleashed his psychic awareness to determine Zhang Jiu’s current location, while he circled around the floating continent at full speed. Hundreds of meters beneath them, Nie Tian, who was planning to run away, stopped. He had caught every word of the conversation between Sha Cheng and Sun Xuan with the help of his Heaven Eyes. He had also witnessed Sun Xuan bouncing back on his way towards him. Sun Xuan even seemed to have sustained injuries from it. After a moment of pondering, he suddenly realized that there must be some sort of barrier around this floating continent, where he and Pei Qiqi were free to travel about. They hadn’t run into that barrier, nor had Zhang Jiu, Sha Cheng, and the other Poison Sect disciples, which meant that barrier didn’t have any restrictive effect on Greater Heaven stage cultivators. However, the barrier would prevent those with cultivation bases higher than the Greater Heaven stage from entering. At that moment, via his Heaven Eyes, which were scattered and covered a large area around him, Nie Tian caught sight of a few other Poison Sect disciples approaching from the distant void. He had originally planned to leave this floating continent as soon as possible. However, after pondering the situation for a moment, he came up with a new plan. Eyes fixed on Sun Xuan, he slowly stepped backwards to hide himself in the dense forest. Then, via his Heaven Eyes, he discovered to his surprise that Pei Qiqi had failed to finish off Zhang Jiu. Even though his life-spirit vermin, the Crimson Chain Snake, had died, he had somehow broken away from Pei Qiqi. Nie Tian rushed towards her without hesitation. Moments later, they reunited in the depths of the dense forest, where he found Wu Cui and Luo Ting’s corpses, which both had blood on their necks and foreheads. The members of the court had three sets of clothing: regular, court and ceremonial. Imperial clothes were made with silk, gold, sliver, pearls, jade, rubies, sapphires, coral, lapis lazuli, turquoise, agate, various kind of fragrant woods, kingfisher feathers and thread made from peacock feathers. 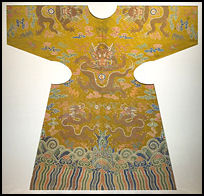 Beginning in the Sui dynasty (581-618 A.D.) the emperor appropriated the color yellow and prohibited other people from wearing it based on a purported precedent set by the legendary Yellow Emperor. Imperial clothing accessories included belts, ceremonial hats, regular hats, hairpins, headdress ornaments, bracelets, thumb rings, fragrance pouches, purses, watches, rosaries, belts (regular, court and ceremonial), necklaces hat finials, hat decorations, silk purses, shoes for bound feet, hats withe jeweled knobs, headbands, silk kerchiefs, fans, rings, buttons, hooks, earnings, brooches and fingernail guards. Robes were the most visible and decorated garments. They were usually made of silk and featured lavish colors, exquisite stitching and a variety of embroidered decorations and symbols. Most pieces that remain today date to the Qing Dynasty (1644-1911). The Qings (Manchus) were horse people and many of their garments were designed for riding on horses. Many robes have long horseshoe-shaped cuffs because it was considered impolite to show one's hands and fingers.